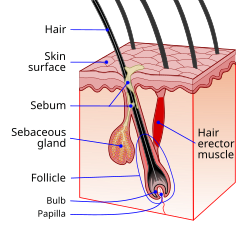 The hair follicle is a dynamic organ found in mammalian skin. It resides in the dermal layer of the skin and is made up of 20 different cell types, each with distinct functions. The hair follicle regulates hair growth via a complex interaction between hormones, neuropeptides and immune cells. This complex interaction induces the hair follicle to produce different types of hair as seen on different parts of the body. 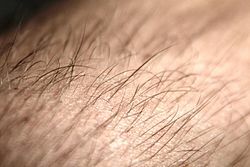 For example, terminal hairs grow on the scalp and lanugo hairs are seen covering the bodies of fetuses in the uterus and in some new born babies. The process of hair growth occurs in distinct sequential stages. The first stage is called anagen and is the active growth phase, catagen is the resting stage, telogen is the regression of the hair follicle phase, exogen is the active shedding of hair phase and lastly kenogen is the phase between the empty hair follicle and the growth of new hair. The function of hair in humans has long been a subject of interest and continues to be an important topic in society, developmental biology and medicine. Of all mammals, humans have the longest growth phase of scalp hair compared to hair growth on other parts of the body. For centuries, humans have ascribed esthetics to scalp hair styling and dressing and it is often used to communicate social or cultural norms in societies. In addition to its role in defining human appearance, scalp hair also provides protection from UV sun rays and is an insulator against extremes of hot and cold temperatures. Differences in the shape of the scalp hair follicle determine the observed ethnic differences in scalp hair appearance, length and texture. There are many human diseases in which abnormalities in hair appearance, texture or growth are early signs of local disease of the hair follicle or systemic illness. Well known diseases of the hair follicle include alopecia or hair loss, hirsutism or excess hair growth and lupus erythematosus. Structure of a hair follicle. The position and distribution of hair follicles changes over the body. For example, the skin of the palms and soles do not have hair follicles whereas skin of the scalp, forearms, legs and genitalia have abundant hair follicles. There are many structures that make up the hair follicle. Anatomically, the triad of hair follicle, sebaceous gland and arrector pili muscle make up the pilosebaceous unit. Around the papilla is the hair matrix. A root sheath composed of an external and internal root sheath. The external root sheath appears empty with cuboid cells when stained with H&E stain. The internal root sheath is composed of three layers, Henle's layer, Huxley's layer, and an internal cuticle that is continuous with the outermost layer of the hair fiber. The bulge is located in the outer root sheath at the insertion point of the arrector pili muscle. It houses several types of stem cells, which supply the entire hair follicle with new cells, and take part in healing the epidermis after a wound. Stem cells express the marker LGR5+ in vivo. Attached to the follicle is a tiny bundle of muscle fiber called the arrector pili. This muscle is responsible for causing the follicle lissis to become more perpendicular to the surface of the skin, and causing the follicle to protrude slightly above the surrounding skin (piloerection) and a pore encased with skin oil. This process results in goose bumps (or goose flesh). There are ethnic differences in several different hair characteristics. The differences in appearance and texture of hair are due to many factors: the position of the hair bulb relative to the hair follicle, size and shape of the dermal papilla, and the curvature of the hair follicle. The scalp hair follicle in Caucasians is elliptical in shape and, therefore, produces straight or wavy hair, whereas the scalp hair follicle of people of African descent is more curvy, resulting in the growth of tightly curled hair. In utero, the epithelium and underlying mesenchyme interact to form hair follicles. Hair grows in cycles of various phases: anagen is the growth phase; catagen is the involuting or regressing phase; and telogen, the resting or quiescent phase (names derived using the Greek prefixes ana-, kata-, and telos- meaning up, down, and end respectively). Each phase has several morphologically and histologically distinguishable sub-phases. Prior to the start of cycling is a phase of follicular morphogenesis (formation of the follicle). There is also a shedding phase, or exogen, that is independent of anagen and telogen in which one or several hairs that might arise from a single follicle exits. Normally up to 90% of the hair follicles are in anagen phase, while 10–14% are in telogen and 1–2% in catagen. The cycle's length varies on different parts of the body. For eyebrows, the cycle is completed in around 4 months, while it takes the scalp 3–4 years to finish; this is the reason eyebrow hair have a much shorter length limit compared to hair on the head. Growth cycles are controlled by a chemical signal like epidermal growth factor. DLX3 is a crucial regulator of hair follicle differentiation and cycling. Specifically, colocalization of phosphorylated Smad1/5/8 complex and DLX3 regulate role for BMP signaling to Dlx3 during hair morphogenesis in animal models. The catagen phase is a short transition stage that occurs at the end of the anagen phase. It signals the end of the active growth of a hair. This phase lasts for about 2–3 weeks while the hair converts to a club hair. A club hair is formed during the catagen phase when the part of the hair follicle in contact with the lower portion of the hair becomes attached to the hair shaft. 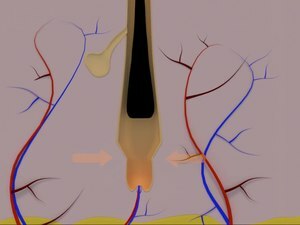 This process cuts the hair off from its blood supply and from the cells that produce new hair. When a club hair is completely formed, about a 2-week process, the hair follicle enters the telogen phase. The telogen phase is the resting phase of the hair follicle. When the body is subjected to extreme stress, as much as 70 percent of hair can prematurely enter the telogen phase and begin to fall, causing a noticeable loss of hair. This condition is called telogen effluvium. The club hair is the final product of a hair follicle in the telogen stage, and is a dead, fully keratinized hair. Fifty to one-hundred club hair are shed daily from a normal scalp. Scalp: The time these phases last varies from person to person. Different hair color and follicle shape affects the timings of these phases. There are many human diseases in which abnormalities in hair appearance, texture or growth are early signs of local disease of the hair follicle or systemic illness. Well known diseases of the hair follicle include alopecia or hair loss, hirsutism or excess hair growth, and lupus erythematosus. Therefore, understanding the function of the normal hair follicle is fundamental to diagnosing and treating many dermatologic and systemic diseases with hair abnormalities. Hair follicles form the basis of the two primary methods of hair transplantation in hair restoration, Follicular Unit Transplantation (FUT) and follicular unit extraction (FUE). In each of these methods, naturally occurring groupings of one to four hairs, called follicular units, are extracted from the hair restoration patient and then surgically implanted in the balding area of the patient's scalp, known as the recipient area. These follicles are extracted from donor areas of the scalp, or other parts of the body, which are typically resistant to the miniaturization effects of the hormone DHT. It is this miniaturization of the hair shaft that is the primary predictive indicator of androgenetic alopecia, commonly referred to as male pattern baldness or male hair loss. When these DHT-resistant follicles are transplanted to the recipient area, they continue to grow hair in the normal hair cycle, thus providing the hair restoration patient with permanent, naturally-growing hair. More than 60% of men and 10% of women suffer from hair loss. While hair transplantation dates back to the 1950s, and plucked human hair follicle cell culture in vitro to the early 1980s, it was not until 1995 when hair transplantation using individual follicular units was introduced into medical literature. ^ a b c d e f g h i j k Hair growth and disorders. Blume-Peytavi, Ulrike. Berlin: Springer. 2008. ISBN 9783540469117. OCLC 272298782. ^ a b c Gilhar, Amos; Etzioni, Amos; Paus, Ralf (2012-04-19). "Alopecia areata". The New England Journal of Medicine. 366 (16): 1515–1525. doi:10.1056/NEJMra1103442. ISSN 1533-4406. PMID 22512484. ^ Pawlina, Wojciech; Ross, Michael W.; Kaye, Gordon I. (2003). Histology: a text and atlas: with cell and molecular biology. Hagerstown, Maryland: Lippincott Williams & Wilkins. ISBN 978-0-683-30242-4. ^ Ma DR; Yang EN; Lee ST (2004). "A review: the location, molecular characterisation and multipotency of hair follicle epidermal stem cells". Ann. Acad. Med. Singap. 33 (6): 784–8. PMID 15608839. ^ Cotsarelis G (2006). "Epithelial stem cells: a folliculocentric view". J. Invest. Dermatol. 126 (7): 1459–68. doi:10.1038/sj.jid.5700376. PMID 16778814. ^ Lin, K. K.; Andersen, B. (2008). "Have Hair Follicle Stem Cells Shed Their Tranquil Image?". Cell Stem Cell. 3 (6): 581–582. doi:10.1016/j.stem.2008.11.005. PMID 19041772. ^ "Histologic Diagnosis of Inflammatory Skin Diseases, Chapter 1. Embryologic, Histologic, and Anatomic Aspects". Derm101.com. Archived from the original on 2012-10-21. ^ Chernova, Olga (May 2014). "Scanning electron microscopy of the hair medulla of orangutan, chimpanzee, and man". Journal of Biological Sciences. 456 (1): 199–202. doi:10.1134/S0012496614030065. PMID 24985515. ^ S.V, Kshirsagar (July 2009). "Comparative Study of Human and Animal Hair in Relation with Diameter and Medullary Index" (PDF). Indian Journal of Forensic Medicine and Pathology. 2 (3). ^ a b c Paus R; Cotsarelis G (August 1999). "The biology of hair follicles". N. Engl. J. Med. 341 (7): 491–7. doi:10.1056/NEJM199908123410706. PMID 10441606. ^ Hwang, J.; Mehrani, T.; Millar, S. E.; Morasso, M. I. (2008). "Dlx3 is a crucial regulator of hair follicle differentiation and cycling". Development. 135 (18): 3149–3159. doi:10.1242/dev.022202. PMC 2707782. PMID 18684741. ^ Park, G. T.; Morasso, M. I. (2002). "Bone morphogenetic protein-2 (BMP-2) transactivates Dlx3 through Smad1 and Smad4: Alternative mode for Dlx3 induction in mouse keratinocytes". Nucleic Acids Research. 30 (2): 515–522. doi:10.1093/nar/30.2.515. PMC 99823. PMID 11788714. ^ Brannon, Maryland, Heather. "Anagen Phase". The New York Times. Retrieved 2007-11-14. ^ Brannon, Maryland, Heather. "Categen Phase". The New York Times. Retrieved 2007-11-14. ^ Brannon, Maryland, Heather. "Telogen Phase". The New York Times. Retrieved 2007-11-14. ^ S Malkud (1 September 2015). "Telogen Effluvium: A Review". J Clin Diagn Res. 9 (9): WE01–3. doi:10.7860/JCDR/2015/15219.6492. PMC 4606321. PMID 26500992. ^ Bernstein RM; Rassman WR (September 1997). "Follicular transplantation. Patient evaluation and surgical planning". Dermatol Surg. 23 (9): 771–84, discussion 801–5. doi:10.1111/j.1524-4725.1997.tb00417.x. PMID 9311372. ^ Orentreich N (November 1959). "Autografts in alopecias and other selected dermatological conditions". Ann. N. Y. Acad. Sci. 83 (3): 463–79. doi:10.1111/j.1749-6632.1960.tb40920.x. PMID 14429008. ^ Wells J; Sieber VK (December 1985). "Morphological characteristics of cells derived from plucked human hair in vitro". Br. J. Dermatol. 113 (6): 669–75. doi:10.1111/j.1365-2133.1985.tb02402.x. PMID 2420350. ^ Bernstein RM; Rassman WR; Szaniawski W; Halperin A: (1995). "Follicular Transplantation". Intl J Aesthetic Restorative Surgery. 3: 119–32. ISSN 1069-5249. OCLC 28084113.